Using other apps like dropbox when picking images. Before using DVRImageSlicer, you should configure ADW Ex property first. We highly recommend enabling “Auto Stretch” option. 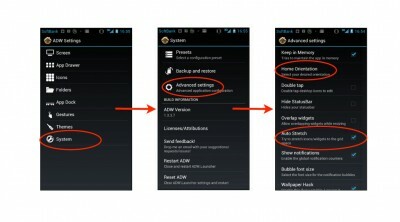 With disabling this option, you’ll see gaps between widgets. To enabling this option, select “System” > “Advanced settings” > “Auto Stretch”. Also, we highly recommend fixing home orientation to “Portrait”. 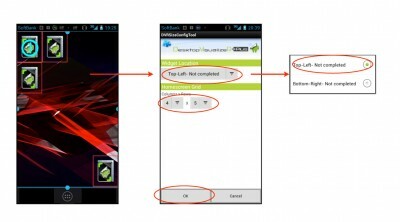 To setting fixed orientation, select “System” > “Advanced settings” > “Home Orientation” > “Portrait”. Next, put 4 DVRSizeConfig widgets. One is at left-top(1), one is at bottom-right(2) and the others are at directly under(3) and right(4) of the left-top. You can confirm gaps between widgets easily. To put widget, long press your homescreen, then select “Add” > “Widgets” in the appeared “ADW Config” dialog and select “DVRSizeConfigTool”. 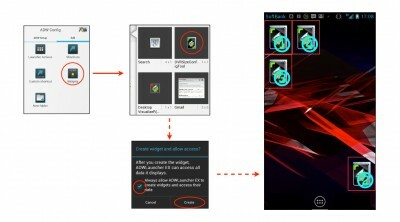 If you see “Create widget and allow access?” dialog, check “Always…” and tap “Create”. Next, select “Resize screens” from ADW Config and drag the outline to perfectly fit the widgets. You may see gaps between widgets. It’s because of rounding error of widget size. 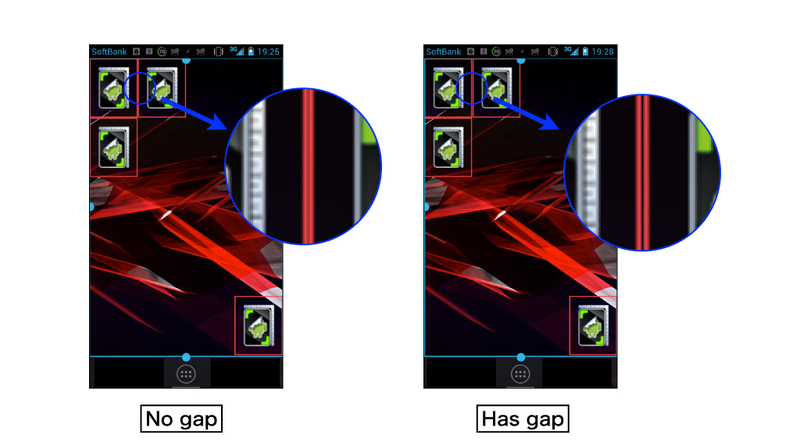 When you see these gaps, stretch or shorten the screen size. Next, tap the left-top (1) widget to run DVRSizeConfig. 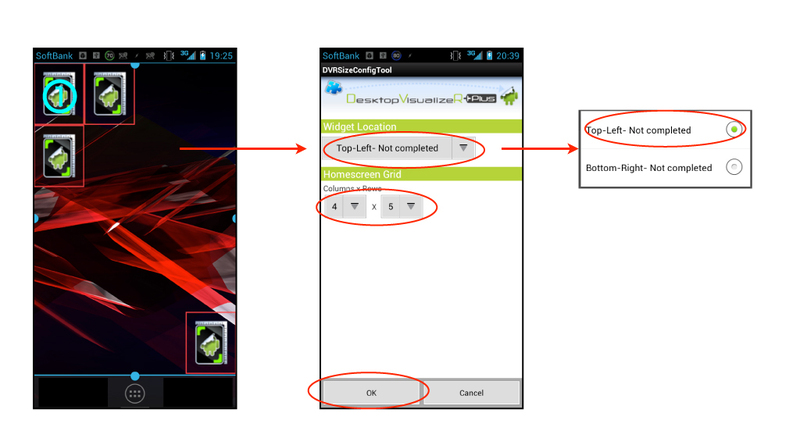 Set “Top-Left” to widget location, homescreen grid and tap OK.
Next, tap the bottom-right (2) widget to run DVRSizeConfig. Set “Bottom-Right” to widget location and tap OK. When you complete both Top-Left and Bottom-Right, DVRSizeConfig sends these size information to Desktop VisualizeR and delete its configuration. Desktop VisualizeR shows the result. 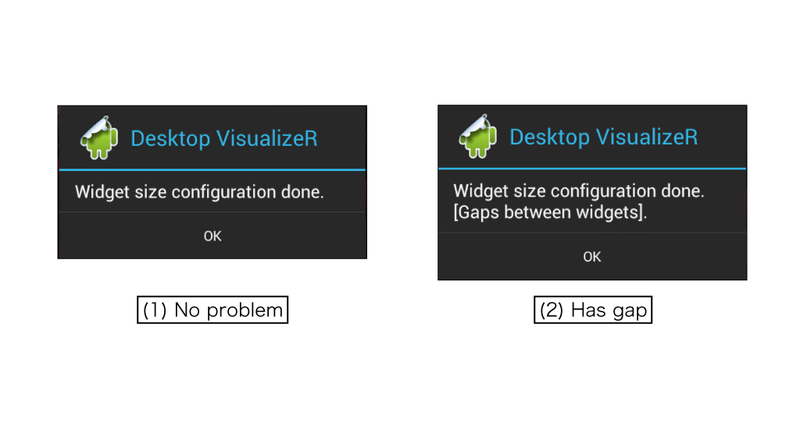 When no problem has been found, it shows “Widget size configuration done.” dialog(1). If it shows “Gaps between widgets”(2), please go back to “Resize screens” and try again. 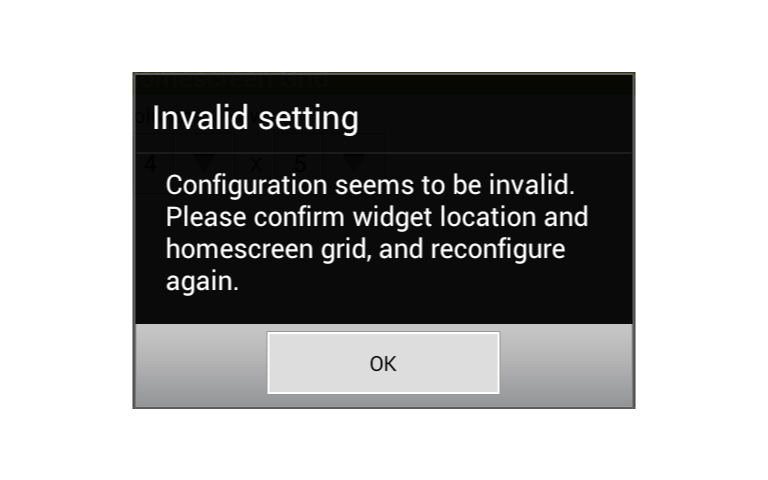 You may see “Invalid setting” dialog when you tap OK. It is shown when DVRSizeConfig cannot determine widget size. For example, when you configure Top-Left and Bottom-Right with the same location, DVRSizeConfig cannot determine widget size. If you counter this result, you should reconfigure already completed location again.